Could you put your white best friend on stage and remind them that they’re part of the problem? 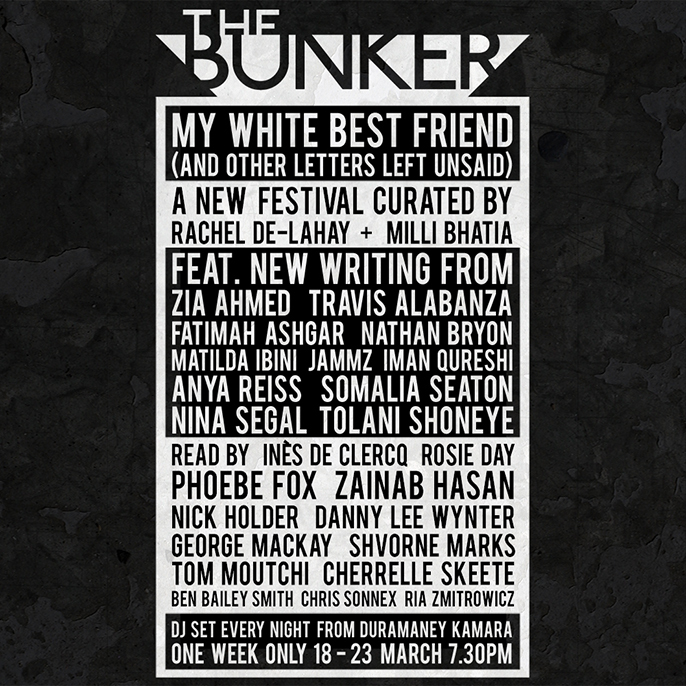 My White Best Friend (and other letters left unsaid) will include work from Bola Agbaje, Zia Ahmed, Travis Alabanza, Fatimah Ashgar, Nathan Bryon, Matilda Ibini, Jammz, Iman Qureshi, Anya Reiss, Nina Segal, Tolani Shoneye. Performers will read these newly created pieces live onstage each night - without having seen them ahead of time. The letters will be read by: Inès de Clerq, Rosie Day, Phoebe Fox, Zainab Hasan, Nick Holder, Danny Lee Wynter, George MacKay, Shvorne Marks, Tom Moutchi, Cherrelle Skeete, Ben Bailey Smith, Chris Sonnex and Ria Zmitrowicz. Post Show: DJs will play late every night of the week and are free for ticket holders.